HP Enterprise - CPP Associates, Inc.
An integrated IT management solution built with a template-based approach that transforms compute, storage, and networking into software-defined infrastructure to automate tasks, accelerate business, deploy infrastructure faster, simplify IT operations, and increase productivity. A fast, simple, and efficient hyperconverged platform that streamlines IT operations and combines your IT infrastructure and advanced data services into a single, integrated all-flash solution at a fraction of the cost of traditional offerings. An artificial intelligence (AI) solution that analyzes and correlates millions of sensors from all HPE globally-deployed systems every second, while it also continuously learns as it analyzes this data, making every system smarter and more reliable. As we move more and more into the digital age your apps often live in multiple data centers and across multiple clouds. HPE Onesphere, a Hybrid Cloud merges on-site IT with cloud to simplify and streamline operations. CPP Associates helps Post University manage IT costs and streamline IT operations so they can grow enrollment and support a rapidly growing distance learning program. 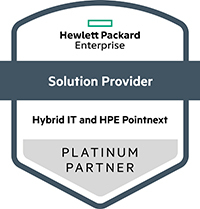 HPE SimpliVity makes their transformation possible.